This valuable resource book will assist all parishes in welcoming children to communion now that the Church of England has approved new regulations. A timely guide to the current discussion. - Publisher As it is now 10 years since the Church of England began an experiment in letting children come to communion at a young age, it is now time for a standard work on the subject. This title draws together all the background, experience, theology and resources in order to lead the church to full participation. It includes interviews with David Stancliffe (Bishop of Salisbury), Diana Murrie (National Children's Officer), Mark Russell (Archbishop's Council), Andy Perry (Vicar of Longfleet St Mary, Poole), Stephen Venner (Bishop of Dover) and others. Including biblical and historical overviews, children's perspectives, a review of current resources, the national picture, and a reflection on the Guidelines of the House of Bishops, "Let the Children Come to Communion" is set to become the standard text on this very topical subject. About "Let the Children Come to Communion"
As it is now 10 years since the Church of England began an experiment in letting children come to communion at a young age, it is now time for a standard work on the subject. This title draws together all the background, experience, theology and resources in order to lead the church to full participation. It includes interviews with David Stancliffe (Bishop of Salisbury), Diana Murrie (National Children's Officer), Mark Russell (Archbishop's Council), Andy Perry (Vicar of Longfleet St Mary, Poole), Stephen Venner (Bishop of Dover) and others. 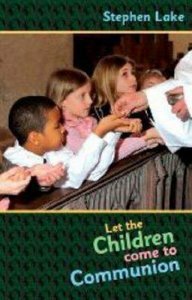 Including biblical and historical overviews, children's perspectives, a review of current resources, the national picture, and a reflection on the Guidelines of the House of Bishops, "Let the Children Come to Communion" is set to become the standard text on this very topical subject. Stephen is Sub-Dean of St. Alban's Abbey, formerly a vicar in Poole, and prepares a large number of children and adults for confirmation each year.